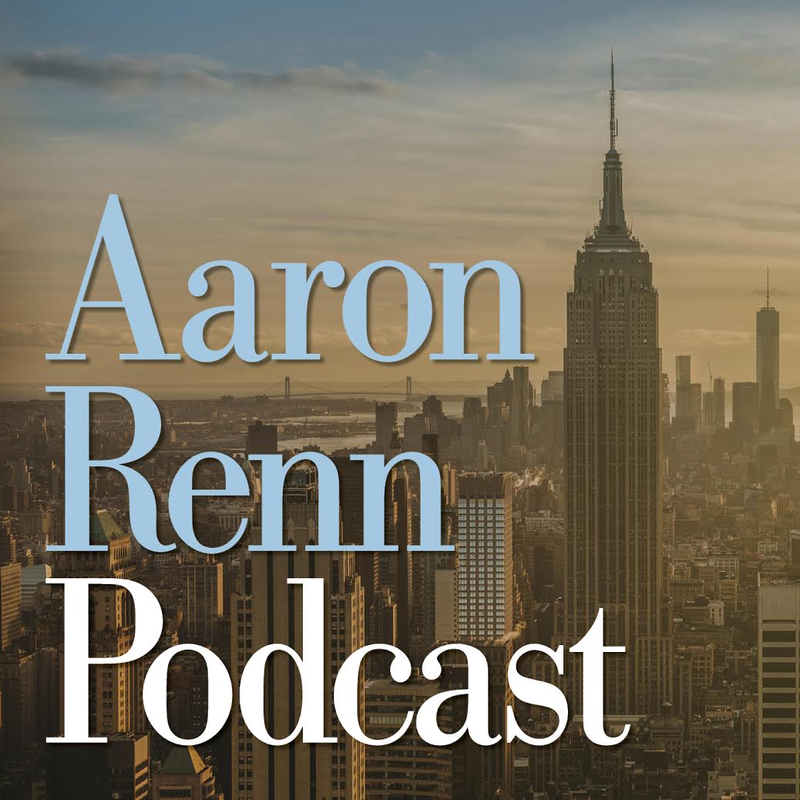 To describe how central stations can help us evolve toward sustainable transportation, this series uses a middle category called “Economic Engines.” This category stimulates its surrounds. These three Chicago stations do that job well. 18 17.0 While OTC gets busy at rush hour, good design made this Chicago’s best functioning station. 14.0 Despite two decades of missteps between agencies of two states, the station turned out OK … except for cost overruns. 13.0 Chicago’s smallest terminus works well and METRA plans to add about 15% more passengers by adding a second line. 32 27 It connects just OK to other transit as well over half choose to walk. 23.5 Most walk to destination or one block to “Elevated.” Bus connections are slighted; crowded at street level. 23 The building is less ped-friendly than OTC, but connects best to transit with the “El”, a subway and has a protected bus station. 50 36 For redeveloping its surrounds, OTC is in America’s Top 5. 37.5 Surrounds are the tops; one of the world’s great urban park destinations, many office buildings and lots of mixed uses. 34.0 Surrounds to the south and west have not redeveloped as fast; being separated by expressway traffic. Chicagoland’s twelve commuter lines constitute a system that is nearly the nation’s largest. (New York’s LIRR is slightly larger; while Metro North and New Jersey Transit, respectively, run a close third and fourth). But if we bite-size Chicagoland, we see an analogy to mid-sized cities. The first bite is that six lines terminate at Union Station, leaving six more at these three stations. Here are their counterparts in other cities. 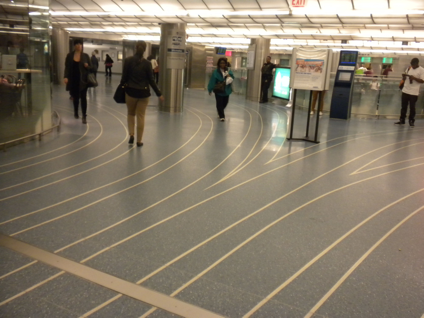 1) Ogilvie Transportation Center (OTC) terminates three lines with commuter volume slightly more than Boston’s South Station. 2) Millennium Station ends two lines from different states, as does DC’s Union Station with similar suburban volume. 3) Lasalle Street Station terminates one large line with passenger visits at just under 30,000 daily, similar to San Francisco’s Caltrain terminus. Also strengthening comparison to other cities, Chicago’s secondary stations connect poorly to one another, creating, essentially, three mid-sized rail systems. Comparing Chicago’s three smaller stations shows other regions how to develop better stations and strengthen the national trend to improve suburban rail. Today, eleven systems in North America carry more than 41,000 passengers daily. Some 15 more fledgling lines are trying to catchup. Highlighting central stations’ future importance, there are 28 new lines in various stages of construction and engineering. In studying some three dozen central stations, I see many similarities to these three in Chicago and hope you find the analogy useful as well. What Do These Three Stations Have In Common? These stations were key parts of the eleven decade transformation from a filthy, industrial downtown to a global center today. In 1900, downtown’s chaotic streets were surrounded by rail yards and warehouses. These stations’ predecessors muted this roughness and provided orderly centers. But as private passenger rail collapsed during the 1960s, Chicago’s downtown also lost its balance. Yet, plans boldly were made to rebuild all three stations. The new ones served as leverage for Chicago’s revival from the 1980s through the 2006 real estate crash and were key to transforming the downtown. A century after Burnham’s fantastic depiction in “A Plan For Chicago,” today’s downtown has a different beauty… but arguably, an equal of those drawings. Transportation established Chicago as central to the nation’s economy. A recent book, Terminal Town, reviews how Chicago used rails. In today’s economy in which people are a key asset, ownership of passenger rails and terminals, again, is strategic. Unfortunately, all three stations are owned by Metra; the beleaguered state agency. This challenge to Chicago’s future cannot be ignored much longer. While Illinois has fiddled away the last five decades without a management scheme capable of remaking the system into a future regional asset, all three termini, somehow, got updated. When you consider that the 1970s and 1980s saw Chicago battling its suburbs, redeveloping these stations seems amazing. That storm and fury was transcended by a simple deal; the suburbs knew these rail lines were their assets also and, as Chicago did, that they could use the rails to revitalize every municipality’s downtown. For the last three decades, Chicago leveraged its land use authority well and turned eyesore rail yards and warehouses into vibrant blocks around all three stations; improving nearby real estate values in ways that only ambitious cities do. Impressively, all three stations work well and OTC is close to great. Here’s how. Main concourse adjoining tracks. Photo by the author.Few stations treat the eye better. Also true of its predecessor, Chicago & Northwestern’s grand concourse evoked the glories of rail travel. But, it was demolished and the new concourse adjoining a 42 story tower was completed in 1984. The new concourse spaciously evokes rail glories in a post-modern setting. Reminiscent of United’s hub terminal at O’Hare Airport, OTC’s main concourse also was designed by the same starchitectural firm. But OTC makes a more important statement on a daily basis: traveling with others in efficient modes makes a better future. Also, few stations better flow during rush hour’s crush. On the photo’s left, 16 tracks end. In the middle (not pictured to the right) are 6 escalators eventually connecting to four street exits. Also not pictured to the left, each train shed platform has stairs so commuters have the option to exit down to a retail concourse (called MetraMarket) with two more street exits. While neither concourse has a suitable waiting area, one can while away time at some 60+ stores in three distinct malls that seem to thrive on the station’s high traffic. OTC was named for Governor Ogilvie. His leadership and staff cobbled together the deals that saved a world-class set of commuter rails while places such as St. Louis let their systems die. The Governor’s public service and this station’s quality explains why Chicago’s downtown revival has been so much faster. 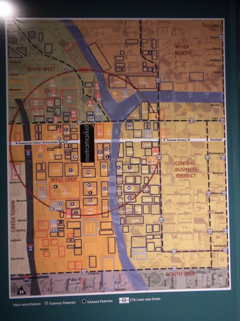 A three block radial walk (map below) depicts how a 42 story tower and tracks have leveraged redevelopment ever since. Large warehouses were converted and old low-lying railroad shacks were demolished and rebuilt into a dense urban neighborhood; mixing office and residential high-rises. To address the retail shortage, the station’s ground level under the tracks was converted into the Metramarket complex (see black rectangle) and includes the destination-like French Market with two dozen gourmet food shops; making dinner easier for suburbanites and nearby urbanites alike. The French Market is not New York’s Grand Central Market, but it is America’s stations’ second best. OTC’s scorecard rating of 80 indicates how well OTC works during its rush hour detraining of passengers to platforms and sorting them to six exits and on paths to their final destination. And OTC does all this while feeding suburbanites slices of 21st Century urban life; hopefully, so they move and add to Chicago’s downtown population which has grown by over 500% since the station was built. 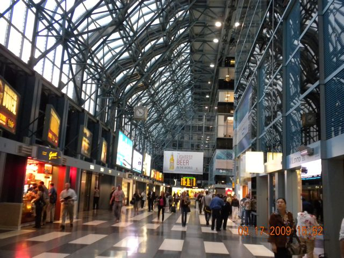 Millennium’s main concourse. Photo by the author.As this station’s metaphor, the center-point above is where the two state agencies and their separate lines meet. Follow those lines and you get to their underground tracks. Yet, redeveloping the Illinois Central rail yard and depots into Millennium Station was not simple for several reasons; a primary one being how cost over-runs of Millennium Park, its above-ground neighbor, affected this station’s construction. More important, the station required Illinois and Indiana agencies to act like partners and mesh different rolling stock, albeit both electric since they run underground for three blocks. (Metra’s other ten lines are diesel). These and other complications created a construction zone for two decades; instead of a station that welcomed suburbanites. Eventually, the collaboration got OK and passenger levels returned after completion. Indiana’s South Shore line has six tracks that terminate at the south end and Metra’s former Illinois Central line terminates on five tracks at the station’s north. Both sets of passengers merge into a concourse with ticketing, a decent waiting area and food shops. 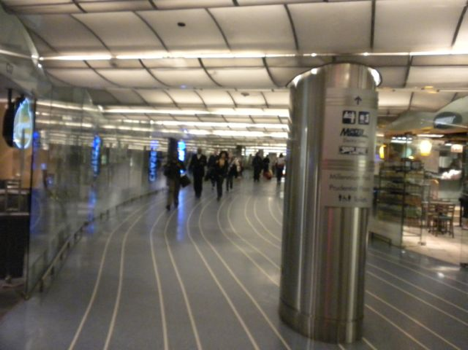 Efficiently, passengers distribute into three exits of Chicago’s extensive underground Pedway; allowing them to escape bad weather or connect to transit. Millennium Station’s main entrance comes from the underground Pedway and contains most of the station’s 10 store retail corridor. Photo by the author.An underground station, it can look like a fancy subway stop. Serving one of the city’s most intense urban areas, the station still is pleasant enough to begin one’s workday and, hopefully, make it less of a grind. With limited room for growth at rush hour, this station is what it is. The scorecard rates it at 75. 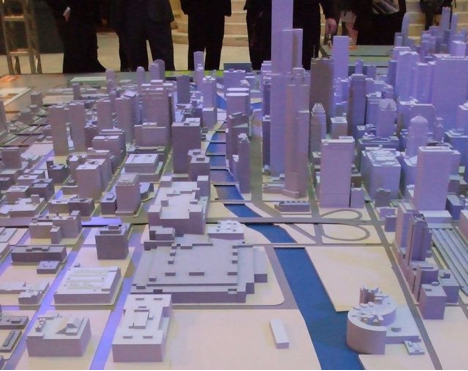 On the far right of this photo of the Chicago Architecture Foundation’s model, you see the train shed leading into Lasalle Station and its adjoining tall Stock Exchange Building. To its left is an expressway and considerable undeveloped land. (The other two stations have almost none). Photo by the author.This fourth remake of Lasalle Street Station had a relatively simple deal. It involved only one bankrupt line (the Rock Island) and Metra also bought the tracks; giving it more control. Much like OTC, the main entrance depends on collaboration with one large building owner. But in Lasalle’s case, the Chicago Stock Exchange was not as accommodating. It is an over-imposing host and unwelcoming to pedestrians. While airy and utilitarian, the station itself works well enough to earn an overall rating of 70. Lasalle does have excess capacity at rush hour and Metra plans to shift the Southwest Service and its 10,000 daily passengers from Union Station to Lasalle, increasing the station’s usage by almost one-third. Entrance and exit to the east-west Congress Expressway. Photo by the author.The station’s only major weakness is an east-west expressway ends under it. Eager to reach high-speeds or slow to slow down, eight lanes of traffic make it harder for urban and pedestrian life to develop. This division makes the station’s south side less desirable to live and work in and has been much slower to develop. This is changing as its parking lots are being built into condos and apartments. 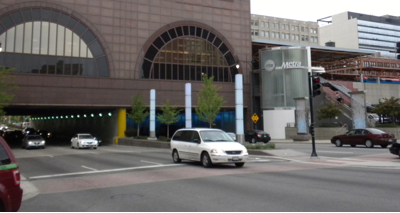 While Chicago is adding streetscapes for urban fabric, the expressway is hard to hide. How Can These Good Stations Contribute In the Future? Each should connect better to transit. While they average about 44% of their passengers who walk to their destinations, the finite number of jobs in each station’s pedestrian shed means that most new commuters are more likely to first want improved transit connectivity. This is more true at OTC, where only 33% of riders walk. To encourage transit transfers, OTC passengers should be able to enter the ‘L’ at the same level they detrain. But with ceaseless inter-agency bickering, de-trainers must go down to the street and up to the ‘L’ whereas a simple passage on the same level would encourage train passengers to use rapid transit. Also, all stations could improve transfers to standard buses in little ways… if some agency had the authority to force Metra to obey the law and participate in the CTA’s Ventra universal card. (An agency with a future would even subsidize the transfer of train passengers to CTA buses and ‘L’). When the downtown Bus Rapid Transit starts in 2015, lousy transfer policies start getting better. 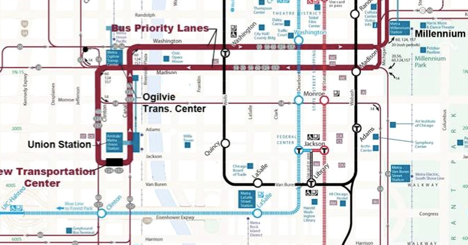 BRT ties together Union Station, OTC and Millennium with several other key stops downtown. To visualize how the BRT works, here is a downtown map with rail termini as the large blue blocks and BRT as the double-red line. As big an improvement as this promises to be, BRT in a congested downtown such as Chicago will only provide temporary relief. BRT is no replacement for an integrated system. (Chicago has twice failed to build an urban circulator). Agencies that squandered time and taxpayer goodwill, now, must resort to the BRT stopgap. Even if achieved, improved connections only will cause the rush hour crush to grow. Now near capacity, the quality of two station’s commute deteriorates with increased ridership. Often touted as panacea, a West Loop Transportation Center (WLTC) that through-routes Union Station and OTC will make greater efficiencies, improve rush hour capacity and speed travel between suburbs. But, a WLTC is highly improbable under Metra’s regime and its poor supervision by Illinois’ RTA. Besides, the WLTC only marginally helps the core problem: Chicagoland’s lines are radial and bring everyone downtown; causing congestion. So a strategic solution would use rails to bring commuters to Chicago’s employment centers that are not downtown. For example, many south-side Chicagoans and suburbanites work at the west-side medical district, one of the world’s largest collection of hospitals. The former Rock Island line easily can be connected to a new medical district station two miles west of Lasalle. If successful, that train eventually could be connected to O’Hare Airport; also a non-9-to-5 employment center that requires better train service. And with service in-between the medical district and the airport, other employment centers will be stimulated. If Metra cannot start this strategy quickly, we should organize a way around it. Chicagoland should consider how trains increase service and stimulate redevelopment in other global cities. London’s Thameslink started in the late 20th Century. It was so successful that redevelopment around its stations now stretches from the once run-down St. Pancras area for three miles through London’s center and across the river (follow the yellow line) to the much more forlorn surrounds of Elephant & Castle. While hard to see in my photo, the six stations in this three miles, on average, have redeveloped over 50% of their surrounds. (The St. Pancras foreground shows new construction as the lighter shade, whereas renovations remain the darker shade). 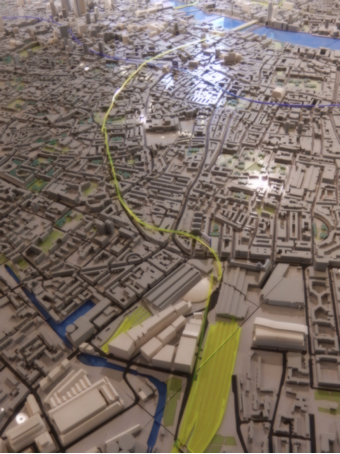 Model is in the lobby of the London Building Centre.As further proof of how trains stimulate redevelopment, note the purple through-line running left to right. The purple is Crossrail; still only mid-way dug. Thameslink’s success signaled to developers that the surrounds of Crossrail stations also are sound investments. Both through-lines have stimulated London’s building boom; one that rarely has been seen by a western city since the industrial era. Such is the leverage generated when suburban rail through-routes and becomes urban rail. On a relative basis, Britain’s passenger rail system seems flexible; being nationalized, ossified and, now, has had operations privatized. Unfortunately, we live under Uncle Sam’s feeble, federated and seemingly unresponsive transportation laws. This allows Metra to be controlled by suburban mayors who tend not to view rails as a metropolitan asset. Stopped by this regime, Chicago needs a new strategy before it can benefit from London’s example. However given that Illinois laws recently allow public-private partnerships (which have similarities to London’s laws), we should explore how trains can redevelop urban areas. 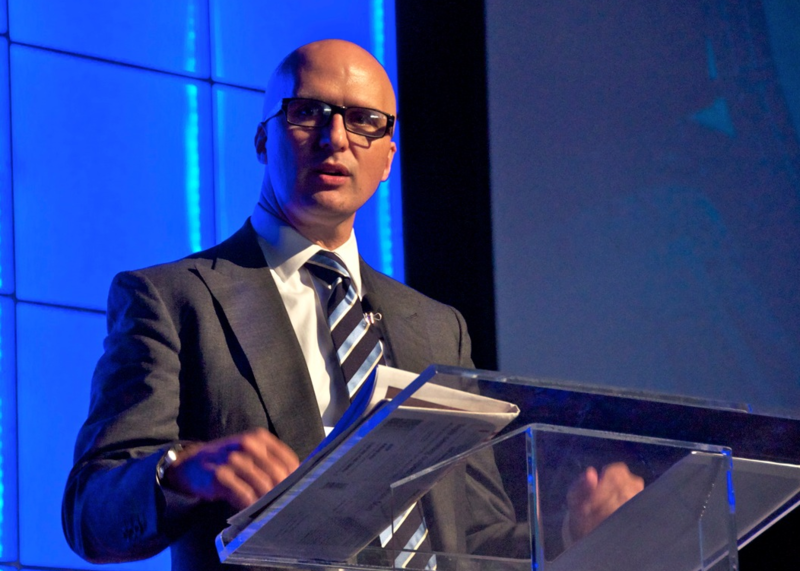 Using an asset to metropolitan benefit leads to sustainable transportation. Mid-sized American cities want what these three stations have. All three stations function well at peak hours and help redevelop their surrounds, the key goals of this series’ Economic Engines category. But, all three have limited potential to serve as a symbol that pulls their train system into a sustainable future. Chicago’s “little engines that could” — owned by Metra — might improve service with a few small steps, such as improving connectivity to transit. But even if Metra were to be reformed into an adequate agency, these improvements only push the stations past their rush-hour capacity and, thus, still are not on a path for sustainable transportation. To maximize trains’ potential, strategies must increase off-peak travel and serve employment centers other than downtown. Through-routing can increase ridership and stimulate redevelopment outside of downtown. But these strategies are unlikely to emerge under an outdated, scandal-riddled agency that appears to have lost its social contract with passengers and taxpayers. So that trains can help inspire the confidence needed to attract new public and private capital to redevelop targeted areas, this series in 2016 will explore how Chicagoland’s agent for sustainable transportation “should” operate. Robert Munson lives in Chicago and can be reached at robertmunson@earthlink.net.